Our readers are constantly asking us for tips and travel advice for popular gay destinations so we’ve decided to create a series of guides to help inspire you and plan your visit. We’ve included just the top recommendations in this post but you can download the full version of the Gay Barcelona guide for free. We’ve even included a mobile friendly version to take on the go! Barcelona needs little introduction and it’s one of the most popular destinations in all of Europe. With year around mild temperatures, a sea side location and a welcoming atmosphere for LGBT people, it’s no wonder that gay travelers from around the world come here to indulge in the culture, nightlife and vibrant atmosphere. If the warm weather and seaside location isn’t enough, its stunning architecture and welcoming gay scene will keep you coming back for more. Barcelona is one of those cities that has so much to offer, you can never see it all. Given the number of attractions and places of interest, you should probably plan on spending at least 3 to 4 nights here to really get a good feel. There are many nice neighborhoods in Barcelona to stay including Raval, Barceloneta and Gracia. If you want to be in the heart of the action, the gay neighborhood is called Eixample (its nickname is “Gaixample”) and is centrally located in the city. Barcelona is incredibly easy to get around and the city offers great public transport with the metro, regional trains and buses. The regional train is called the Rodalies and is best used for traveling longer distances or to go outside of the city center. Taxis are also fairly inexpensive and you probably won’t pay more than 10-15€ per ride if you’re staying in the center of the city. You can buy multi-day public transport tickets here. The airport is located 12 kilometers (8 miles) from the city center and takes about 35 minutes via public transport. The most economical route is to take the regional train (Rodalies line R2, 4€ one way) to one of the central stations in the city center – the station called Passeig De Gracia would be the closest to Eixample and you can always transfer to the metro from there if needed. A taxi should cost about 25-30€ from the airport to the city center. A private transfer can also be booked in advance starting from 39€. If you are traveling to Barcelona during high season (June to August), on the weekends or during major gay events, you’ll need to book these rooms in advance to ensure availability. Many of these properties are small and book quickly when in high demand. 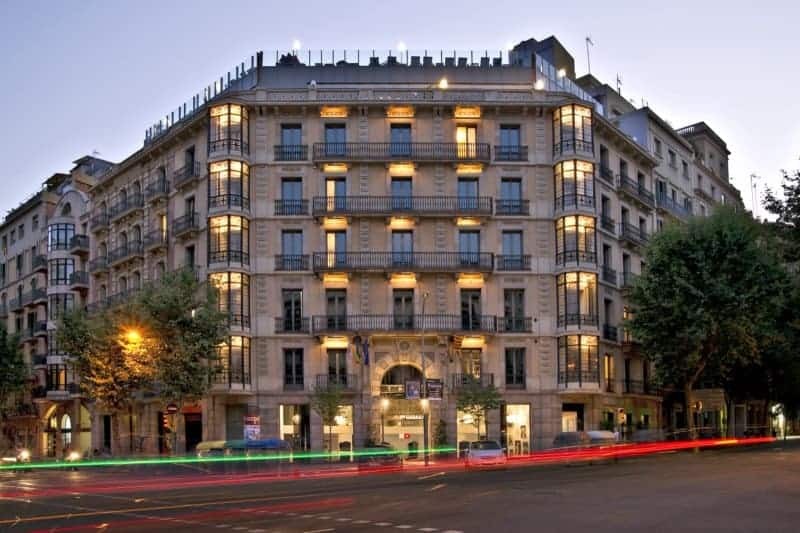 Hotel Clarís – this property is actually located in Eixample near plenty of shopping and cultural attractions, only steps away from the Passeig de Gràcia, the legendary Plaza Catalunya, Las Ramblas and the historic Gothic Quarter. It’s also a gay friendly place and our friends at Rainbow Barcelona Tours have partnered with them for their luxury option. Rooms start at 150€ per night. Axel Hotel – There are countless places to stay in Barcelona, but one of the most famous gay places is the Axel Hotel. They are first gay hotel chain to coin the term “straight-friendly.” And even better is the rooftop patio with a pool and bar. Even if you don’t stay here, the rooftop bar is open to the public and well worth a visit during the evening for a cocktail and nice view. The Axel is located in the heart of the Eixample gay neighborhood. Great gym and restaurant onsite. Rates start at 100€ per night. Two Hotel by Axel – the new, second edition of the Axel Hotel. The demand for rooms at the original Axel has been so high that they are opening a second hotel in Eixample. The original Axel will still be the larger, flagship property but this new hotel opening in July 2015 will be another option with a different style though still offering a fantastic rooftop terrace and bar. Rates also start at 100€ per night. Hotel Soho – a gay friendly property, without specifically being a gay-only hotel. Hotel Soho is open and welcoming to anyone, but they’ve made the conscious effort to embrace the LGBT community. They support the Barcelona Pride fund which puts on the annual gay pride each June, and come July, they even offer a dedicated poolside bar during the infamous Circuit Party. Located in Eixample. Rates start at 65€ per night. TOC Hostel – this is a high end, designer hostel located in Eixample. It’s not necessarily a gay place, but they are very gay friendly and our friends at Rainbow Barcelona Tours have partnered with them. This is a great option if you’re on a tight budget or really like the social atmosphere found in hostels. You’ll find lots of great common areas plus an outdoor pool and terrace. They offer both shared and private rooms starting at 20€ per night. You can also find budget friendly options at gay hostals in Barcelona. Hostals are not to be confused with youth hostels. In Spain, a hostal is a small, privately owned 1 to 3 star hotel with private rooms and basic amenities. Rates are often as low as 40€ per night for a private room with a shared bathroom. Barcelona City Center Hostal – a gay-owned hostal in Eixample with simple and clean private rooms. It’s located just three streets away from Las Ramblas and the Gothic Quarter. Rates start at 50€ per night. Fashion House – a gay owned bed & breakfast located in a 19th century building in the heart of Eixample, not far from the Paseo de Gracia and Plaça Catalunya. The property is intimate and elegant and room rates start at 50€ per night. There are many sites for apartment rentals in Barcelona, with AirBnB probably being one of the most popular. Prices are generally comparable to budget hotels, especially if you’re willing to get a room in a shared apartment. 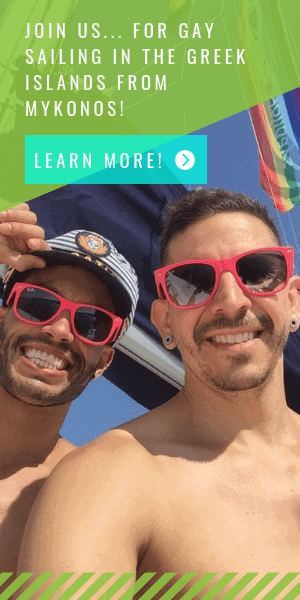 There are even a few LGBT-oriented booking sites like misterb&b with listings from gay hosts for gay guests where you can either rent a whole apartment or a private room in a shared apartment. Understanding Barcelona’s gay scene is much more easily done with the help of a local and apartment sharing is one of the best ways to meet someone living in the city who knows how things work, where and when are the best nights to go out, and what places to eat at and which to avoid. You could spend weeks in Barcelona visiting the numerous architectural wonders, historic plazas, art museums, beaches and parks. But we know, most people will just spend a few days here so we’ve narrowed down our top must-see places on any visit to Barcelona. Sagrada Familia – Paris has its Eifel Tower, New York the Statue of Liberty and for Barcelona, the Sagrada Familia is without a doubt the most famous landmark of the city, designed yet never finished by Antonio Gaudi. It’s one of those places that people expect you to visit. An entrance ticket costs 15€ and you might face a long wait especially in the high season. 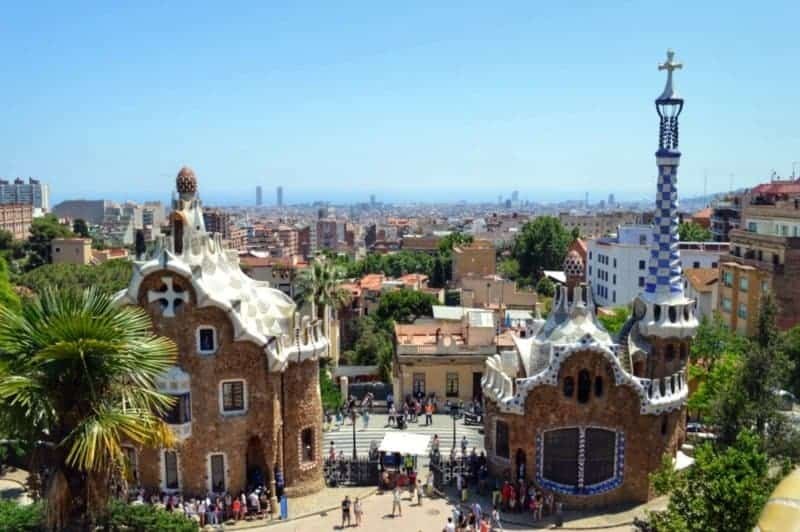 Park Güell –this park is another one of Gaudi’s creations and it’s another place worth a visit. The park offers both free portions and a paid entrance which gives you full access to the park. It’s certainly one-of-a-kind and a must-see attraction if you’re a fan of Gaudi. Admission is usually granted on reserved time slots so consider buying your ticket in advance. Beaches –one of the few cities in Europe with so much to offer including a beach to relax in the warm, Mediterranean weather. Barcelona’s beaches are nice but not necessarily top ranking. In fact, the beaches have only been around since the revitalization project in preparation for the 1992 Olympics. But nevertheless, the weather’s great and it’s a great spot to relax during the heat of the day while enjoying a nice cocktail or afternoon meal if you’re feeling lazy. Palau Nacional and the Magic Fountain – this palace was built for the 1929 International Exhibition in Barcelona and now houses the National Art Museum of Catalonia. You’ll find the Magic Fountain at the foot of the Palau Nacional and the walk up to both attractions is impressive. Download the full guide for more information on free shows. Gothic Quarter – without a doubt, this is one of the highlights of the city where you’ll find the Barcelona cathedral (not the Sagrada Familia) that dates back to the 15th century. Take a walk through the maze of narrow streets which open up to several nice plazas. This is where you’ll find the remains of ancient Roman walls as well as the Jewish quarter and plenty of nice shops and cafes. 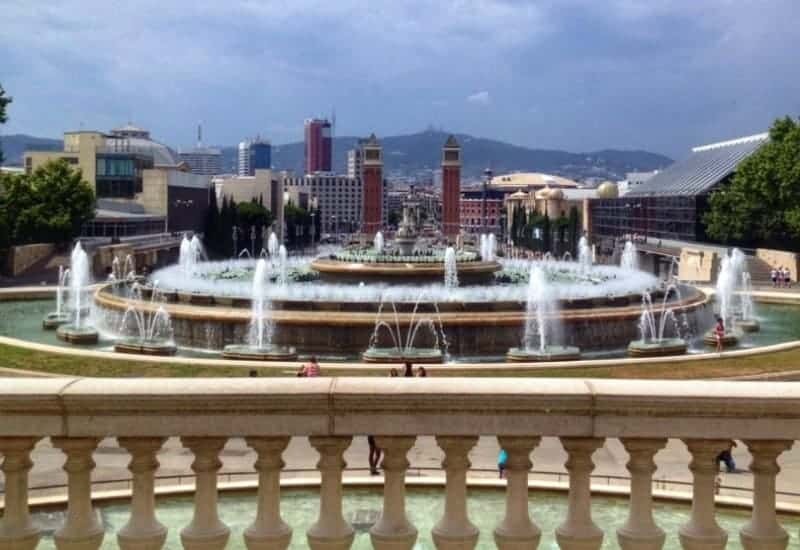 There are tons of tours to choose from when visiting Barcelona so it’s best to decide what you’d like to see and what level of service you want. Some of our favorites are listed below. Rainbow Barcelona Tours – If you’re looking for a tour geared for the LGBT traveler, then we definitely recommend Rainbow Tours Barcelona. We’ve been on several tours and had a great time. They offer city tours as well as nightlife tours with local gay guides that can answer any possible question about gay Barcelona you could ever think of. You can even save 10% on the tours by booking with the code TWOBADTOURISTS. Devour Food Tours Barcelona – If you really want to experience the food culture of Barcelona with a knowledgeable guide, we highly recommend Devour Barcelona Food Tours. We took a similar tour with them last summer in Madrid and had a fantastic time sampling the cuisine at places we never knew to explore. Barcelona is a shopping Mecca and you can find plenty of great items and fashions at reasonable prices. It’s a fashionable city like London or Paris with more sun, warm weather and better bargains. Portal de l’Àngel – this is filled with shops selling high end clothing brands and accessories. Located just off Placa de Catalunya. Plaça de Sant Josep Oriol – full of designer boutiques and handicraft shops. In addition to some interesting shops, you’ll also find street musicians, fortune-tellers and painters. Gothic Quarter – in the maze of narrow streets you can find plenty of antique shops, small bookstores and boutique shops selling cloths from local up-and-coming fashion designers. Depending on the time of day, there are several restaurants in and around Eixample worth a visit. Barcelona has a great gay nightlife scene, especially during the summer. Many of these places are packed on weekends and a couple offer options during the week. Keep in mind that nightlife in Barcelona starts extremely late, so don’t be surprised if you arrive at 11pm to a bar (1am at a club) and still don’t see a crowd. Just wait another hour and the place will fill up. Download the full guide for more information and additional listings for nightlife options. Note: Several of the listings here are part of the Arena collection. They operate several bars and clubs with different themes all located near each other. Note: you can also check out Night Barcelona. It’s the “Boyberry” bar, but since the actual Boyberry location in Barcelona doesn’t have a regular bar, they’ve opened another place located right in Gaixample (the gay neighborhood of Barcelona). If you’re like us, you’ll probably be stumbling from the club to your hotel around 5am and will be in desperate need for something fat and greasy to eat. The go-to drunk munchie food in Barcelona is probably the kebab. You can find places open late in most of the central neighborhoods so keep an eye out on your stumble back. Do yourself a favor and plan an extra day or two for a lazy and relaxed day where you don’t feel the pressure to wake up early and go sightseeing. There’s nothing worse than going to sleep at 5am and waking up at 9am to get on a tour bus. Barcelona actually has a decent brunch culture so head to places like Brunch & Cake for a nice hangover brunch. If you’re really lazy, you can layout on the beach to sleep off your hangover and get a fresh fruit smoothie from Rocambolesc Gelateria at Platja de Sant Sebastià (the smaller and less popular gay beach) to replenish your body with vitamins and electrolytes. Besides hitting up the bars and clubs, you can find plenty of gays hanging out at a couple beaches in Barcelona. The biggest gay beach in Barcelona is called Platja de la Mar Bella. Its located at the far left of the beaches (facing the sea) closest to metro stop Poblenou (line 4). Lots of local and foreign hotties come here during the warmer months and there are a number of beach side bars and restaurants to enjoy nearby, most notably El Chiringuito BeGay. Each June Barcelona holds its gay pride where some 300,000 people attend. Barcelona is probably more well-known for Circuit, one of the most famous gay events of its kind each August. With more than 70,000 gays from around the world attending the 12-day event full of parties, it’s a must-attend for anyone really into the circuit party scene. New Years in Barcelona is also quite popular for gays and you can also attend BEARcelona in April (if that’s your type of crowd), the Matinee Easter Weekend party, the Barcelona International Gay & Lesbian film Festival (for a more cultured experience) or plan a visit to Barcelona on the Atlantis Mediterranean cruise that ports here each summer. Sitges – one of the most popular gay destinations in Spain and just 40km south of Barcelona. You can easily take the Rodalies regional train here for a day trip or overnight visit. Sitges is a beautiful beach destination with the classic white painted buildings and blue shutters framing the windows. The town is well known for being a popular gay-friendly destination and the restaurant and bar scene reflect this. Girona – located 100 kilometers northeast and by train takes about an hour and half to reach. 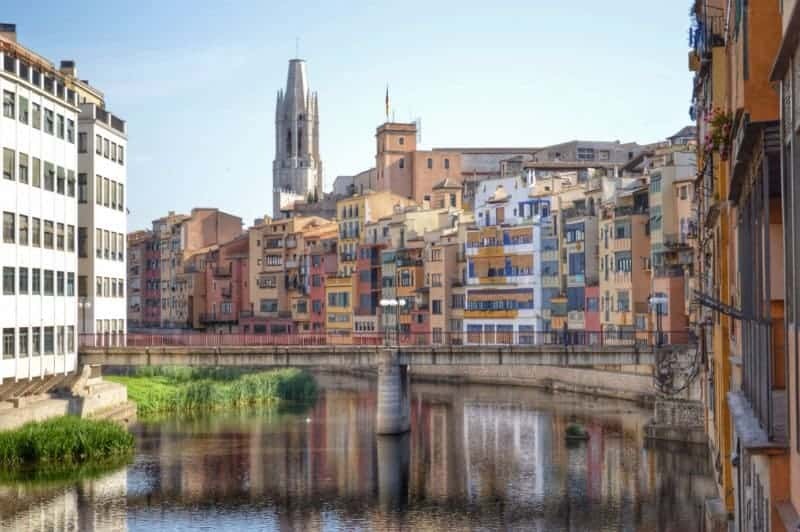 Girona is one of the more prominent cities in Catalonia and has famous sites in the well preserved old town like the Girona Cathedral, the city wall, the Church of Sant Feliu, Plaça de la Independència, and remnants of Jewish history before their expulsion from Spain. Figueres – located in the same direction as Girona, but another 40 kilometers farther. It’s a two-hour train ride from the city. It’s most famous as the birthplace of painter Salvador Dalí and might be worth an overnight visit if you have the time. The museum he designed called Teatre-Museu Gala Salvador Dalí is here and holds the largest collection of Dalí’s completely unique and odd works. Montserrat – a beautiful mountain monastery located one hour northwest of Barcelona renowned for its unique rock formations. You can reach the mountain by a scenic train route and then take a funicular up to the top. It’s considered one of the most important and significant sites in all of Catalonia. Rainbow Barcelona Tours even offers guided tours to both Sitges and Montserrat if you prefer a local guide and don’t want the hassle of planning the trip yourself. You can even save 10% on the tours by downloading the full guide. We’ve got great tips and additional considerations for your trip in the full guide including things like finding the perfect portable smart phone charger, buying travel insurance, accessing a VPN, buying European rail passes and getting airport lounge access. What interests you most about Barcelona? Would you consider visiting? Let us know in the comments below! Featured image courtesy of Rainbow Barcelona. Yaass! Nice guide – I’ve stayed at the Hotel Claris before and highly recommend it – they’ve got a cool rooftop bar, too. In my experience, Barcelona is one of the most tourist unfriendly cities (high prices, lots of scams & petty theft) but it doesn’t stop me from visiting again and again. Can’t get enough of it, actually! Ya we share your opinion somewhat. It’s a great city but it can sometimes have an annoying amount of tourists which drives the high prices, scams and pick pocketing. Hi Guys – thanks for the help. FYI, just booked Hotel Soho for our trip in May but they did not recognize your discount code. Wanted to make sure you got credit for the referral. Hi John – sorry to hear the discount code didn’t work. Perhaps they only extended it through 2016. Hope you enjoy your trip! This is a great guide and one that I look forward to religiously follow for my planned trip to the city in Feb 2018. Not sure if all the information is still relevant, but this is definitely going to be handy. Is there are any “local” apps that I could use to get more acclamitized with the community? Thanks, guys! Cheers! Hi Shane – it should still be relevant. We updated it last year with some advice from a local. Definitely let us know if something has changed that we need to include or remove. Have fun.